This article appeared in RCM of February 1977. 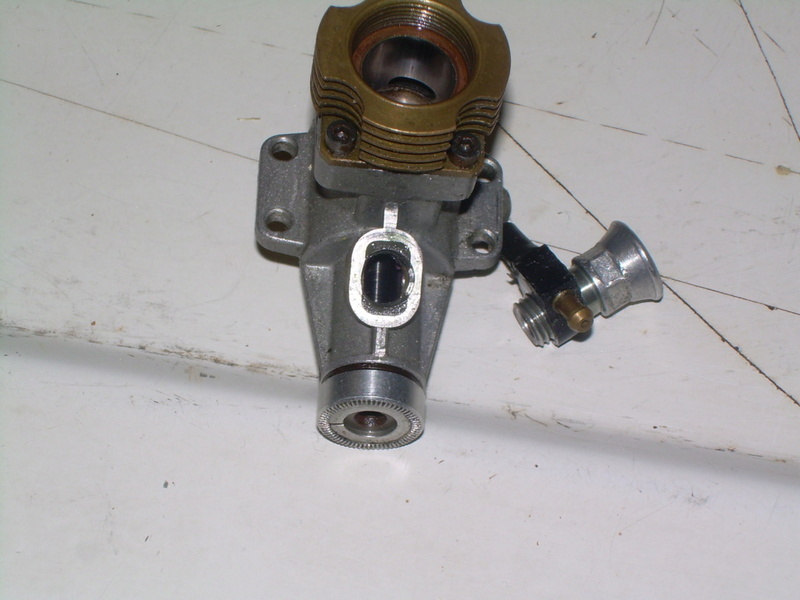 It explains how to install a fine thread NV assembly into a TeeDee carb. The magazine can be downloaded from the RC Library on Outerzone. Interesting, I’ve been contemplating doing something very much like this. 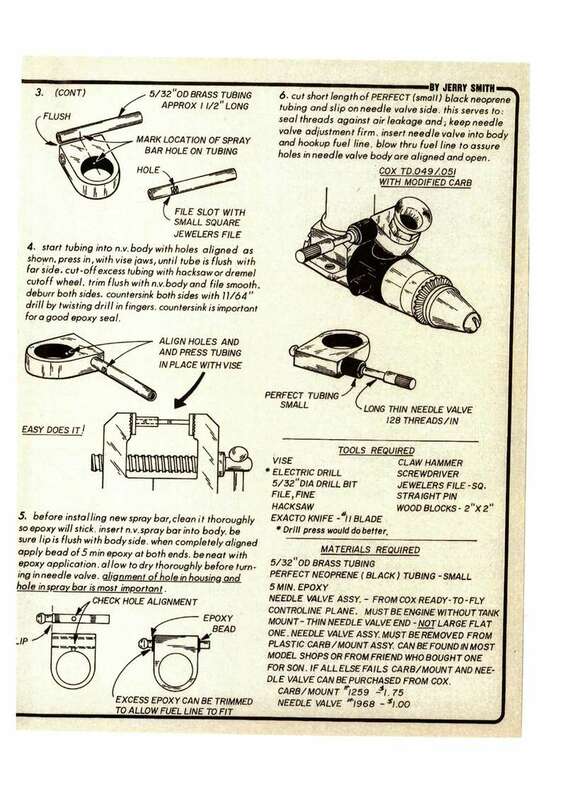 That's what they had to do before Dale Kirn started making and selling the Kirn-Kraft 128 tpi needle valves. And it turned out to be the premium trick for feeding the TD with pressure bladders. Now days they are readily available, but I see they cost more than twice as much since I last bought one for $15 from TexasTimers.com. Now at $35 bucks makes the old DIY method worth while. 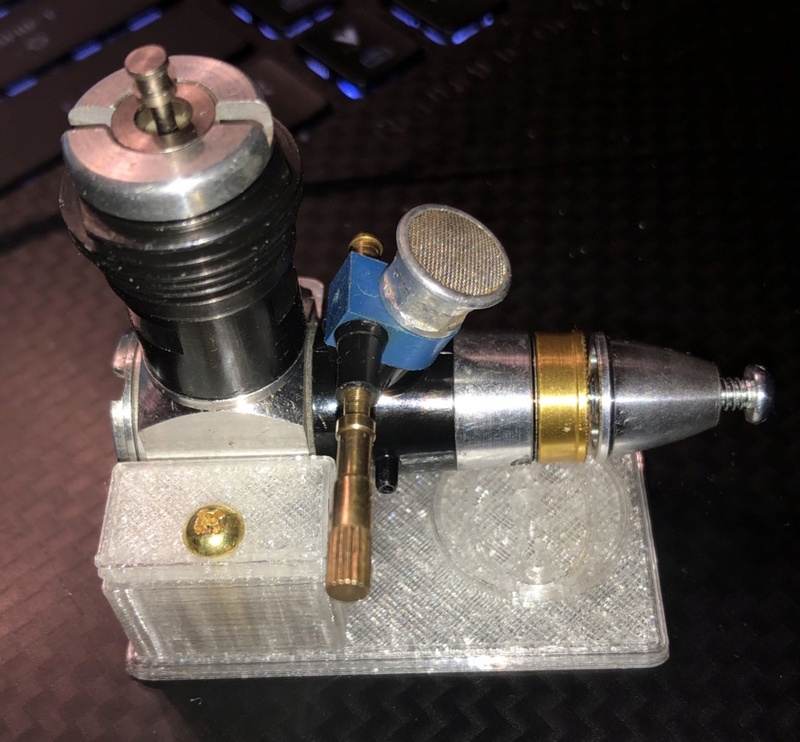 It's also perfect, and even simpler, for Norvel 1/2A engines. Same size tubing and all I do believe. My old tutorial is out there somewhere, posted here and at RCGroups. I probably learned it from Ken Cook. Thanks, Lieven. Hope you are doing well these days. A few months earlier in the 09/76 issue of RCM, a reader suggests following modification to obtain the same. 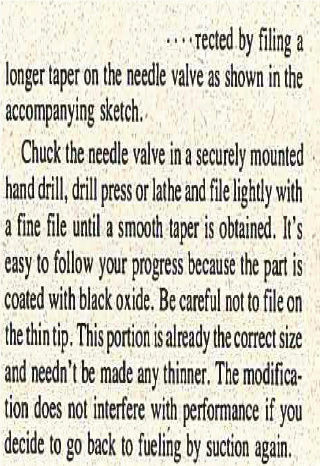 I doubt filing the taper works well because you probably won't have enough thread to screw it in all the way. It may still work for setting mixture, but it probably never close fully. File too much and it may never lean out enough, even with the needle bottom out on the available threads. Drilling out the post of a old glow plug to your desired opening can easily yield a simple venturi. The plug will screw right into the carb body. Drill a hole into the side of one of the hex flats and solder a small piece of 1/8" copper and you can use a remote needle setup from pretty much any of the OS r/c engines which will work using pressure. The stock TD needle still has a fairly coarse thread which regardless of needle taper is going to offer less than desirable results. While it will work, it's going to be very touchy. To compensate for this, you do one or two things which is raise the nitro or run a smaller prop. Due to lack of camera currently, I can't post a pic. I make a banjo fitting from wheel collars. Remove the set screw from the wheel collar and drill out the hole to 1/8". Solder in a small 1/2" stub of 1/8" tubing. Press a128 TPI needle valve body out of a postage stamp backplate. Prepare the inside of the wheel collar for solder and clean the spraybar by chucking it up in a drill press using some steel wool. 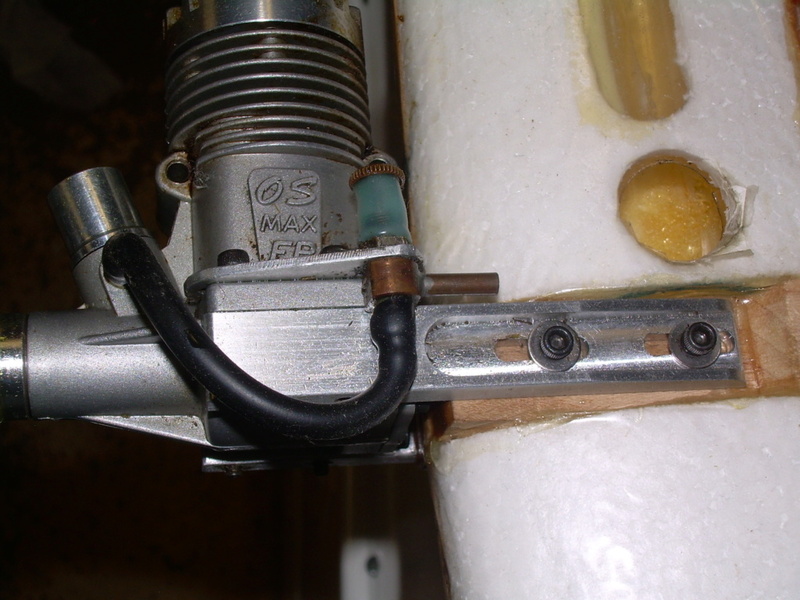 DON"T clean around the hole where the fuel exits as this will keep solder from entering into the hole. Solder the spraybar into the wheel collar aligning the spraybar hole with the copper you soldered into the collar. You just need to fabricate a bracket and you now have a 128 thread remote needle valve which didn't cost $40. I made most of my .25 LA engine needle valves this way. This caught the attention of Phil Cartier who took pictures and was featured in Flying Models Combat section some years back. I used the needle valve assemblies from VA engines for this. Ken, I'm helping a couple of guys on the Stunthgangar video hangout get set up for bladders to fly in the 1/2A Stunt event that Brodak is going to have this June. If you've got a way to post a picture now, I'd love to see it. I think 1/2A Stunt sounds like loads of fun. I wish I could show up with my new Big Mig powered balsa Hyper Viper. All of my Norvels are retrofitted with fine thread needles from Cox through the venturi. RknRusty wrote: All of my Norvels are retrofitted with fine thread needles from Cox through the venturi. How about pictures and a tutorial. I was thinking about wanting fine needles for my Norvels to run bladder for my Little Legends. Can a fine-thread "Postie" NVA be retrofitted into a Tee Dee or Medallion engine? I ask because I scored a pair of postage-stamp assemblies last year in a consignment-lot at a hobby shop in Sturbridge, (Fiskdale actually) MA. 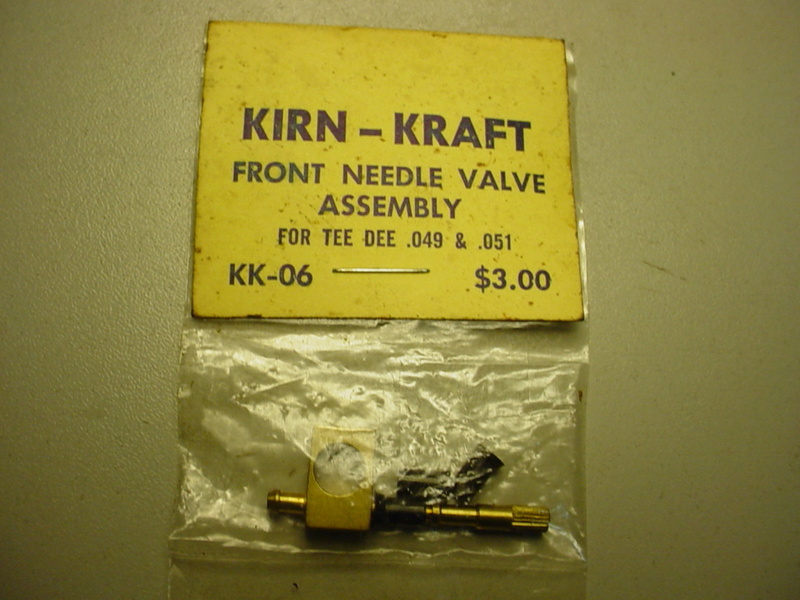 along with a NIP "Kirn-Kraft" fine-thread NVA for Cox Tee Dee .049/.051 engines. I'm actually assuming that the Kirn-Kraft NVA is a fine-threaded one. After all.. why wouldn't it be? Would Kirn's NVA differ from Kustom Kraftsmanship's (Joe Klauses') offering? Yes they can be installed and no there's no difference. 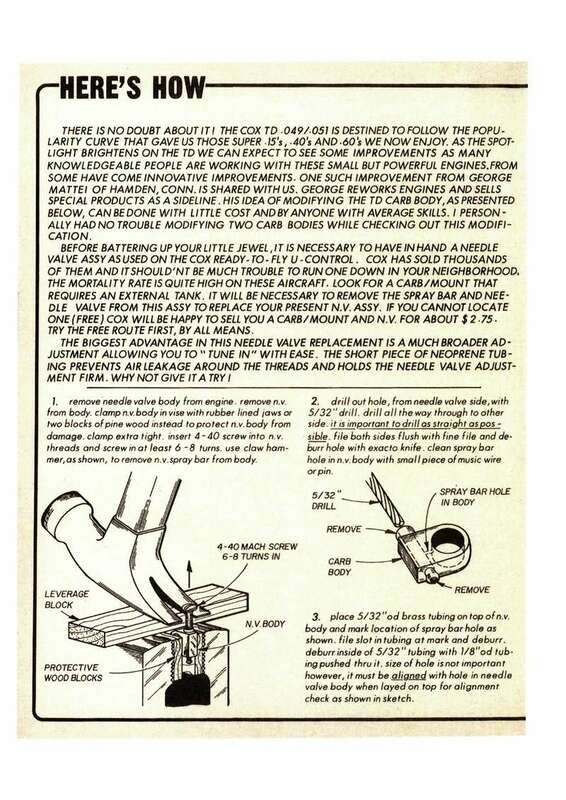 Here's a way to use your TD assemblies. This needle valve assembly was made from a VA engine needle assembly, this could be done using a Cox postage stamp spraybar as well. The VA assembly was a through the case assembly with threads on the one side, I used a wheel collar as mentioned above and soldered the spraybar into it. I use these on my .25's but they were originally used on my 1/2A's. The problem with Norvel cases and similar versions is that they're a bathtub oval. This engine I filled the case with JB weld and drilled it out when dry and tapped it for a Cox TD assembly. I have also used APC broken prop hubs to fill the case, I glue the broken piece into the case and drill and tap it. I have done this to 4 engines. 1/4"-32 tap size for the Cox venturi. 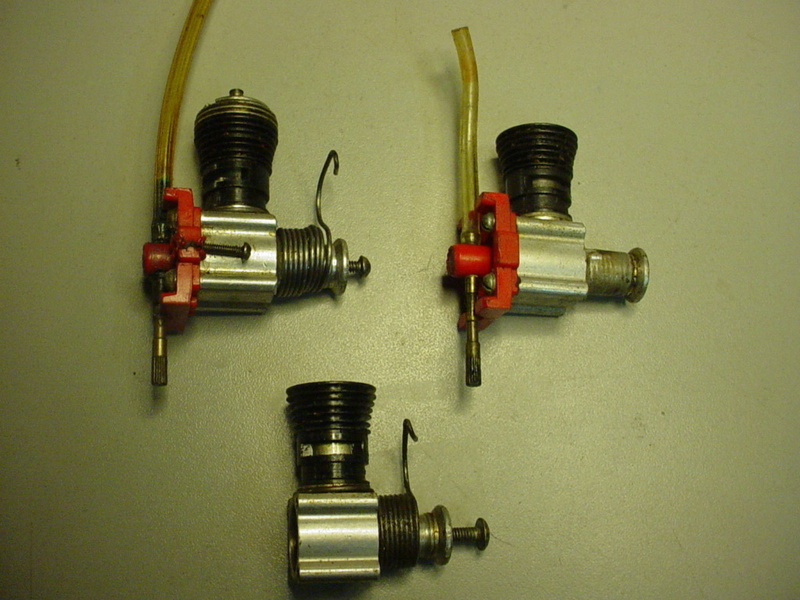 Ace R/C also had a fine thread needle valve assembly available. The stock TD needle still has a fairly coarse thread which regardless of needle taper is going to offer less than desirable results. While it will work, it's going to be very touchy. valve assembly Ex Engines sells? Bill, I took one of the new TD needle valve assemblies from EX Models and pressed in a 128 TPI fine needle. 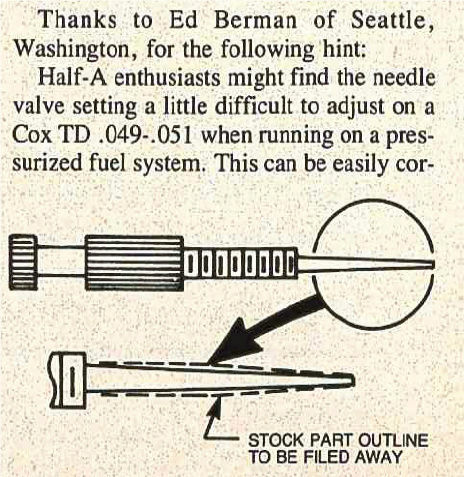 Worked the same as my Ace or Texas Timers needle valve assembly.